Floating vanities are fantastic for creating a simple and airy vibe in your bathroom. Plus this classy design makes cleaning the floors even easier! Skinny tile is in! These long, thin tiles are a fresh variation on the classic subway tile. This new trend is the perfect way to spice up your shower walls or vanity backsplash. A storage ledge, that is. Another great way to streamline your space is with a built-in storage nook in the shower. It creates a simple and sophisticated look that helps keep things clean in more ways than one! Make the biggest statement of them all! Statement mirrors can add a pop of excitement to any space. Whether you go with something oversized and ornate, or a rich yet delicate design, your mirror can create so much life in your space! Marble counters, marble backsplashes, and marble in the shower—it can add the perfect artsy touch to any element in your bathroom. 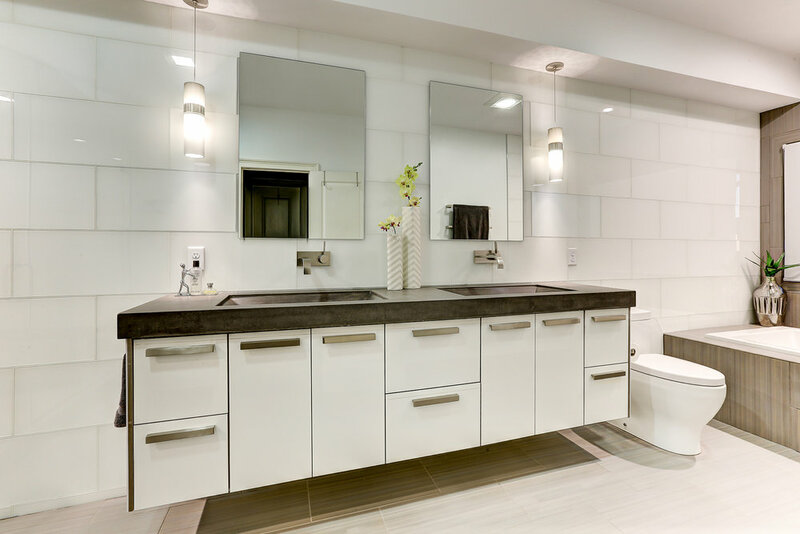 Thinking of freshening up your bathroom this year? Let us help! Fill out our Custom Renovations form here to get the ball rolling! Check out all of the progress on one of our latest projects, The Anchor House!